There has always been some level of lottery involved when buying an SSD-equipped Mac. The first Mac to start the lottery was the 2010 MacBook Air, which initially used Toshiba's SSDs but later it was found that some units were shipping Samsung SSD 470 based drives. Up until last year Apple kept using the same Toshiba and Samsung SSDs; the 2012 refresh finally brought SATA 6Gbps SSDs to Macs and, of course, another round of lottery too. The 2012 MacBook Air kept using drives from both Toshiba and Samsung, albeit both were newer generation (Toshiba's is SF-2281 based, Samsung is PM830). The rMBP, however, used only SSDs from Samsung, and the 256GB and 512GB SSDs in the MacBook Air were all Samsung made as well. Note that these are all retail drives; the drives Apple is using are custom and hence the performance may be slightly different (customized firmware). The X100 in the graphs is actually a newer 88SS9175 based X100 (it might be X110 as SanDisk wasn't very specific) so performance of the 9174 based might be slightly different (we shouldn't be anywhere close to U100 speeds, fortunately). The 9175 is essentially just a low-power version of the 9174 with only four channels, so I wouldn't be surprised if the 9174 based X100 was even faster. However, all the drives Apple uses are good performers. 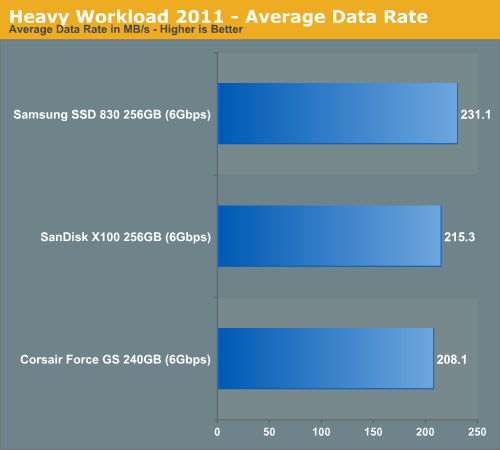 The SSD 830 is the fastest of them all but the X100 and Toshiba are trading blows as you can see above. I'm not surprised by Apple's move. Apple is constantly buying more and more SSDs (and flash in general) and relying on just one supplier is risky. If one manufacturer has a hiccup in production, Apple still has the channel to quickly buy SSDs from another manufacturer. There's also a possibility that the availability of Samsung PM830 is decreasing because it's now a discontinued product. Samsung told me they still have plenty of stock for OEM and B2B customers but the volume Apple needs is fairly significant and Samsung may not be able to supply that anymore. 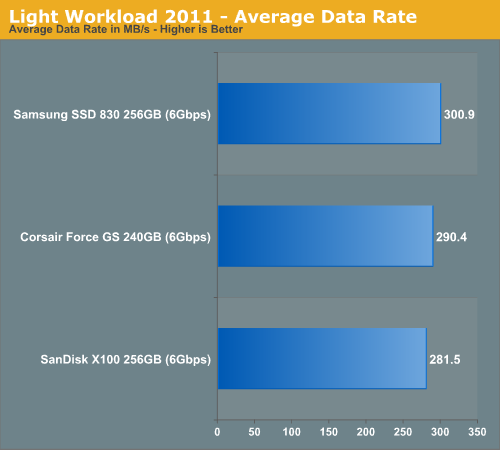 Samsung does have a newer SSD 840 (Pro) available but it's possible that Samsung's pricing made Apple choose SanDisk. Either way, SanDisk is now the third OEM to supply SSDs to Apple. I've only seen the X100 appear in the rMBPs so far but it's certainly possible that we will see SanDisk SSDs in other Macs (such as the Air) too. While I'm sure most of the buyers would prefer the Samsung SSD (including myself), the good news is that none of the drives Apple is using are exceptionally bad. Unless your workload is very IO intensive, there shouldn't be a significant difference in real world performance (except when dealing with incompressible data and the Toshiba drive). Thanks Paul for giving us the permission to use your picture! Unless yoor workload is very IO intensive, there shouldn't be a significant difference in real world performance (except when dealing with incompressible data and the Toshiba drive). I don't think that's not a minor consideration in a notebook however, because far more then in a desktop full disk encryption is really critical, and encrypted data is incompressible. In fact, I'd go as far as to say that at this point FDE should be the standard use case, not the exception. We're long past the point where it causes any noticeable performance degradation in the vast majority of use cases, it's available built-in and transparent for every major OS, and we tend to carry more and more valuable data on our systems. So incompressible isn't some edge thing, it's nearly everything. It's definitely a bigger deal if you're doing encryption. However, I don't want to demonize it too much because not everyone does encryption (I know I'm not doing, hehe) and under non-encrypted workloads the Toshiba SSD will be about as fast. Without any study on the amount of users who use encryption, it's hard to say how big of a deal it really is. I've never been a big fan of SandForce, though, so I agree that incompressible performance should not be any different from compressible. I'm still surprised that Apple went the SF route but I guess they didn't have much options. Good point. However, are Macs used that widely in the corporate world? Most SSDs include AES encryption which is far better than software based encryption, especially from performance standpoint. Unfortunately Apple doesn't use that but most PCs should have the option for hardware-based encryption available in BIOS. And yes, any corporate notebook is going to have mandated FDE. It's an important use case. Any Windows based FDE enterprise solution is either going to be BitLocker or a 3rd party, centrally manageable, solution (Trend, SafeNet, whoever). No one is going to use firmware based encryption on 10's of thousands of end user notebooks that need central control.